By Community Chickens on January 15, 2013 Visit Community's Website. And while I can’t “heel-click” my way to spring, it is nice to be able to flip through the semi gloss pages filled with colorful seeds, flowers, vegetable and possibilities. One of my favorite parts of planning the garden is choosing the sunflowers that we will plant. I’ve always loved sunflowers! They make such a statement and are quintessential to any farmyard. The large yellow heads stand over the garden like giant smiles, picketing for happiness. 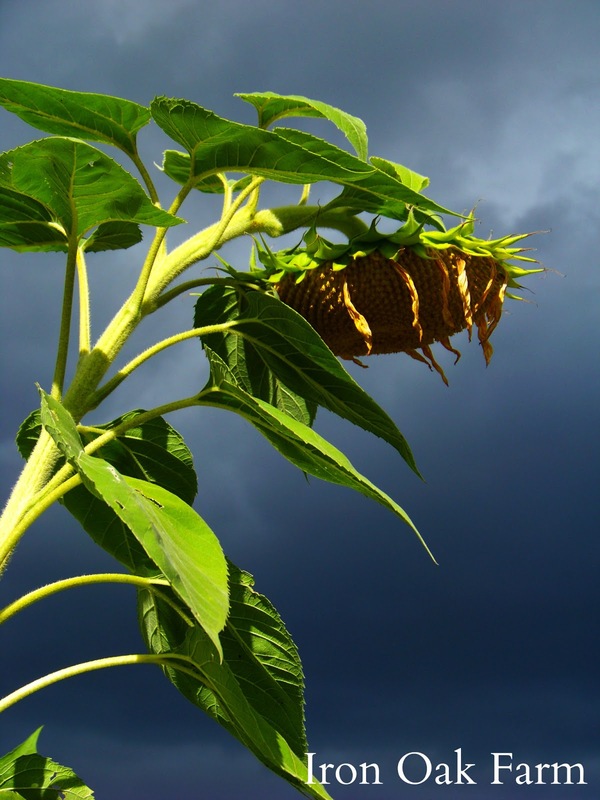 Not only are sunflowers beautiful, but they are functional on so many levels. The heavy stalks work wonderful for supporting trailing vine type plants like pumpkins and beans. When planted in rows, they act as a great windbreak, protecting delicate plants like tomatoes and peppers from leaf coiling in response to heavy winds. 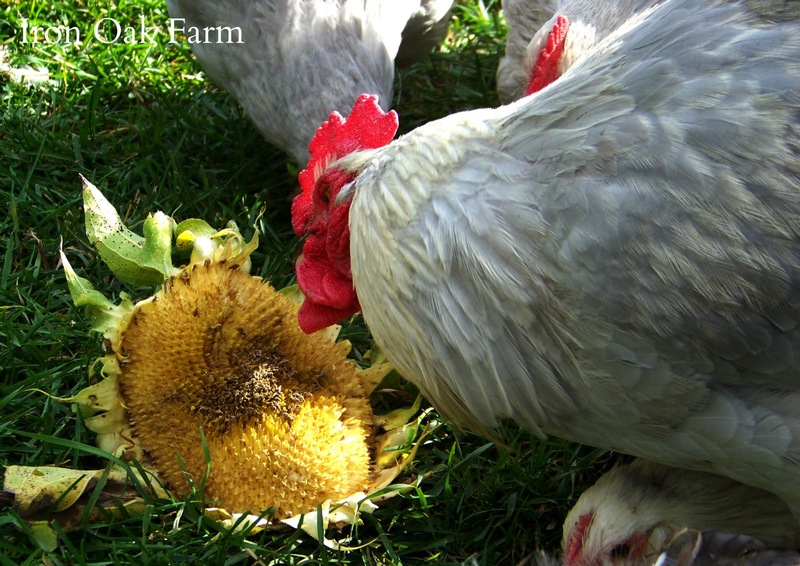 Sunflowers also produce sunflower seeds, a tiny nutritious wonder that when fed in moderation, can have many health benefits for both you and your flock of chickens. Sunflower seeds are high in the B vitamin range which aids the immune system and they are also a great source of calcium which is helpful for laying hens. They are also full of healthy fats that help produce colorful, shiny plumage and rich egg yolks. But don’t over do-it, as in any treat, too much fat and seed based proteins can lead to other health problems. 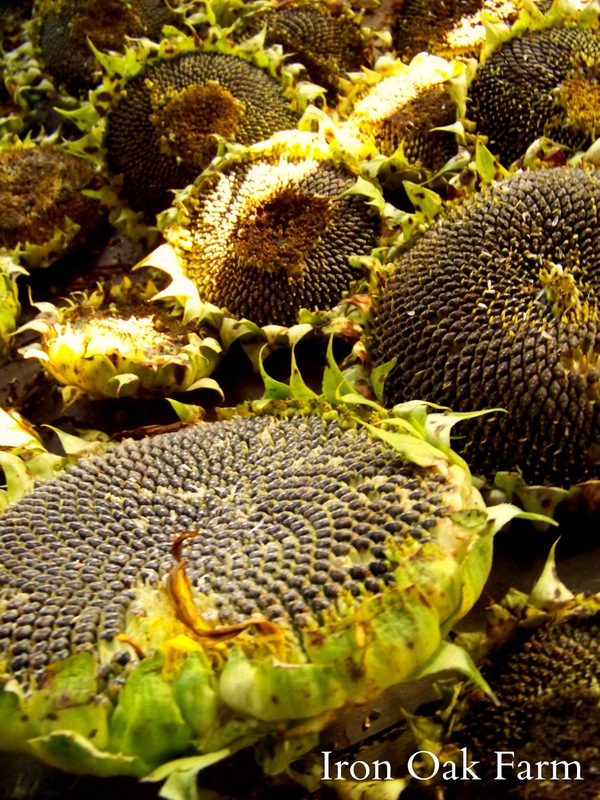 Sunflower seeds should be fed as an occasional addition to a balance diet. Last year we planted a variety of sunflowers. As the beautiful flowers began developing, we would lop off a head and toss it to the chickens, they loved it! The sturdy flowers act as a great boredom reducer as well. It would sometimes take 45 minutes to an hour for our large flock to peck off all the seeds. They would also eat the fibrous flower head and the leaves. Our neighbor who also grew a large crop of sunflowers last year, gifted us with a whole wheel barrel full of sunflower heads. 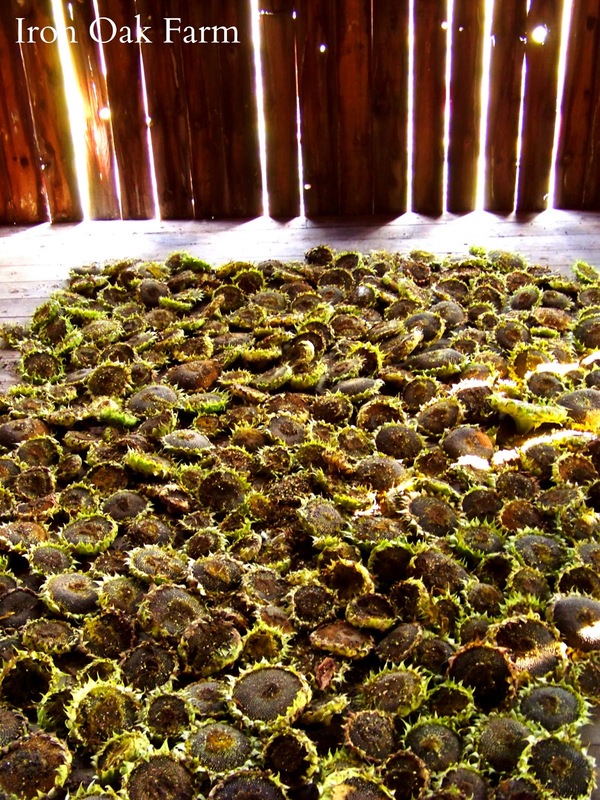 We dried them in the attic of the barn and had enough sunflower treats for the animals to last well into winter. 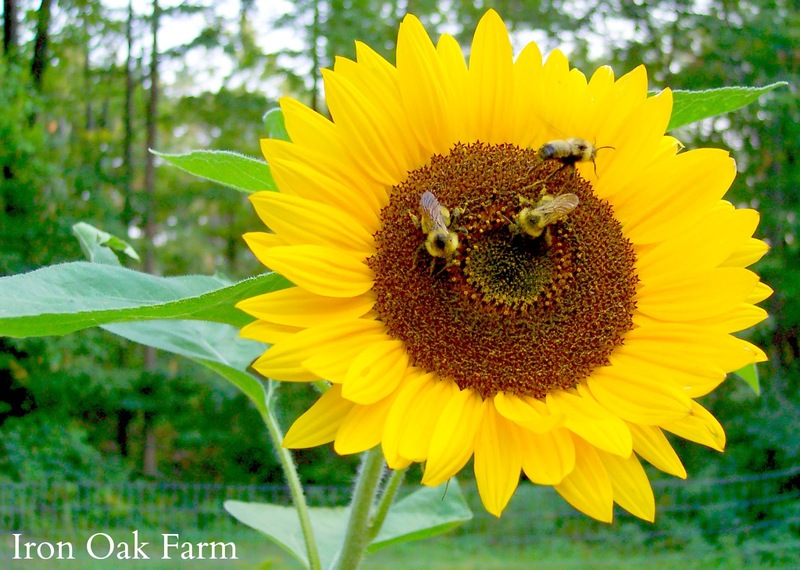 If happy chickens aren’t enough reason to grow sunflowers this year, then do it for the bees! This past spring we added a hive of honey bees to our farm. It was amazing to see how much the bees enjoyed visiting our sunflowers. 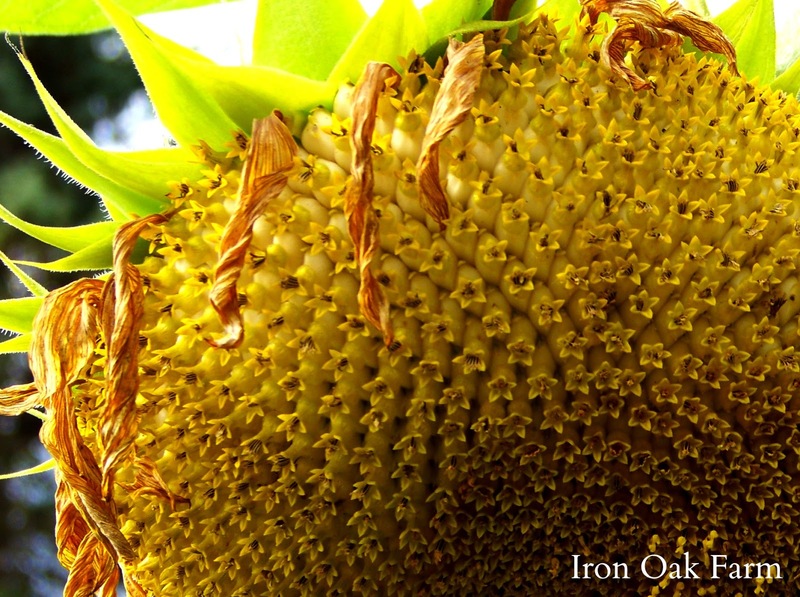 If you look closely at the sunflower head, each seed has a tiny flower that produces pollen. Bees particularly like the variety Lemon Queen. Even if you don’t have a backyard hive, sunflowers are beneficial to all pollinating insects. In recent years, the pollinating insect population has been struggling. Here’s a few reasons why. Spanning lawns with no flowers are replacing wild fields and meadows. The insects have to fly farther to find pollen sources and this increases losses. Widespread use of pesticides not only kills pest insects, but the beneficial ones as well. The honey bee and wild bee populations also face a new threat, Colony Collapse Disorder, a mysterious epidemic that can quickly kill an entire colony. Pollinators are important to the human food system. Many of the foods we eat depend entirely on outside pollinators, so it’s important that we do what we can to help them. Not only can you plant Sunflowers, but you can also join The Great Sunflower Project, or Backyard Bee Count. An organization that collects data from people like you and I. They use this information to help track pollinators and see where they are thriving, and where their numbers are weakening. For more information on The Great Sunflower Project, visit their site at http://www.greatsunflower.org/. 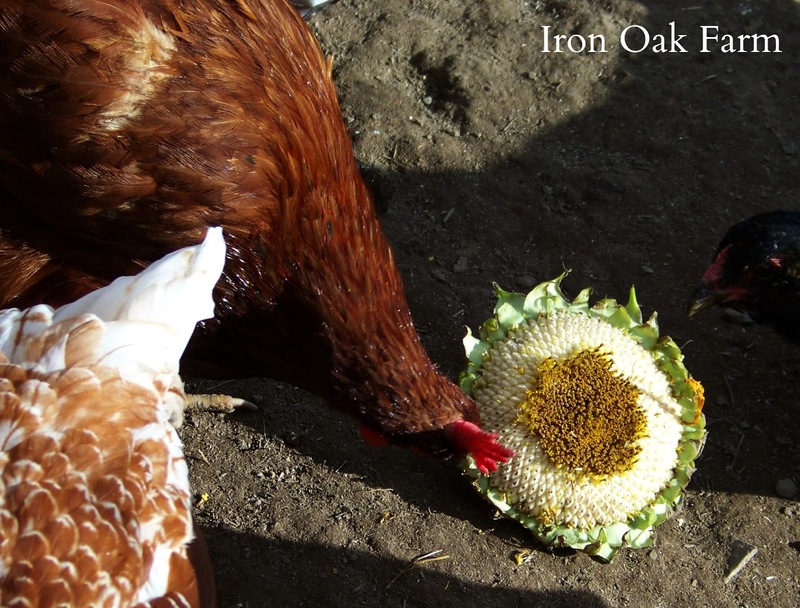 Here’s a little video I put together from footage of our Sunflowers and Chickens, ~enjoy! What seeds are you planning on ordering for your garden this year? Are you planting anything specifically for your chickens? Share your stories by leaving a comment below, visiting the Community Chickens Facebook Page, or join us at Iron Oak Farm. Hi we also grow sunflowers for our chickens. They also give a little predator protection and shade. Here’s a funny video my daughter made one summer when we let our chickens into their sunflower patch that hadn’t really reached the height it was supposed to. Once the chickens realized that they could reach we had popcorn chicken for days! Great post!